WRAP UP LADIES CASTING FOR CONSERVATION TEXAS BILLFISH CLASSIC POCO BUENO & MORE! the parties and help bring a boat back. A full moon sail is always a wonderful time to be on a boat in Texas. Then later in October it’s the J/Fest Southwest Regatta. This will be held at Lakewood Yacht Club on Oct. 29-30. This regatta is open to all J/Boat owners and usually attracts competitive talent from all over the state. They have great parties and great prizes. These three big events should keep you and your family busy this fall. Gulf Coast Mariner Magazine plans to be there every step of the way, so check us out online at gulfcoastmariner.com and on Facebook and Instagram for any up and coming details and results. We hope you enjoy this issue and we hope you get to spend some time on the water. The Galveston Bay Foundation and the Houston Advanced Research Center have released their 2016 report card on the health of the bay. Sailors in this year’s Harvest Moon Regatta will have the opportunity to use the world’s most popular sciencebased handicap system: ORC. 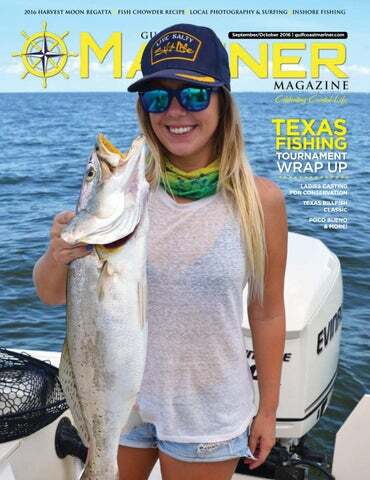 Photography and results from fishing tournaments up and down the coast, including Poco Bueno, Bastante, Lone Star Shootout, Deep Sea Roundup, Texas Billfish Classic and Ladies Casting for Conservation. ON THE COVER Kelly Groce with a 5.9 lb. East Bay trout. Photo by Colie Blumenshine. Lynn Yates, Surfside local and surfboard shaper. Owner of Daddio Longboards. Photo by Adam Valadez. Ian Ringer of Friendswood caught this red in Rockport fishing with his Grandpa. The three amigos. Photo by Kelly Groce. Captain Taylor Borel landed and released a very nice 8-foot sailfish with Wave Dancer Charters. Brenda Lightfoot with a marsh redfish caught on a gold spoon. Chris Bryars, Surfside, TX. Photo by Adam Valadez. Capt. Bob “Mangus” Drisgill with a big trout. Tanker surfing selfie by Carson Einkauf. How healthy is Galveston Bay? he Galveston Bay Foundation and the Houston Advanced Research Center (HARC) released the 2016 Galveston Bay Report Card last month. This is the second year researchers have graded the Bay’s overall health. Some categories have showed improvement, although some became worse. 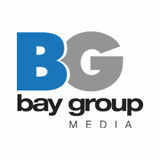 The entire Galveston Bay Report Card can be read online at www.galvbaygrade.org. The report card will be updated annually. Water Quality The overall water quality of Galveston Bay is excellent and was assessed using information describing nutrient and dissolved oxygen levels. This year’s grade is even better than last year’s B. The improvement is consistent with long-term trends of improving water quality as a result of Clean Water Act implementation and ongoing implementation of Watershed Protection Plans in our region. Pollution There were no major oil spills in 2015, but the number of spills has remained the same. A long history of industrial contamination has polluted Galveston Bay sediment. Some contaminants are known to persist in the environment for many years. These are monitored in areas of Galveston Bay and the Houston Ship Channel. Also, trash in the Bay is inadequately monitored. Wildlife Overall, finfish and bird populations are considered adequate and maintaining. Gafftopsail catfish have increased in Upper and Lower Galveston Bay and Trinity Bay, while spotted seatrout have decreased in Trinity Bay. Some shellfish populations, like blue crab and pink shrimp, are deteriorating and require action. Blue crab are an important species ecologically and commercially. Galveston Bay and its watershed contain four key coastal habitats, three which are under stress. Saltwater wetlands are maintaining but freshwater wetlands are deteriorating. These are important as they prevent flooding, filter water and provide wildlife habitat. Underwater grasses, although restored in some parts of the bay, are largely absent. Current data on oyster reefs is incomplete and but there has been decline since Ike. Many types of Galveston Bay seafood are safe to eat, however toxic contamination in the Bay has led to seafood consumption advisories for some species in certain areas. Streams and bayous that flow into the Bay frequently have high levels of bacteria that indicate the presence of microorganisms that can make humans sick via consumption of oysters or contact with water. Coastal Change Coastal change and resilience of coastal communities to hazards such as storms and rising sea levels have become a global priority. Although plants and animals are able to adapt to their everchanging physical environment, they may not be able to adapt to rapid changes associated with rising sea levels, increasing temperatures, acidification of waters, and declining amounts of freshwater. 33.50 The Texas state record for largest tripletail is 33.50 pounds, 34 inches long. Edie Pruitt caught the tripletail in Matagorda Bay in June of 1984. 68 Sailfish are the fastest fish in the sea. They have been clocked swimming at speeds up to 68 miles per hour. 7 Adult menhaden filter 7 gallons of water per minute. Gulf menhaden are filter feeders that eat phytoplankton for the first year of their lives, then as they grow older begin to feed on zooplankton. Jacks are no stranger to coastal jetties. prized silver kings. While the jack may present a comparable fight, it is usually disappointing to the tarpon angler when he see what is on the other end of the line. Certain select baits are required for a good chance at enticing a tarpon while a variety of baits from live to natural to cut baits work on jacks. Jacks, like tarpon, are most likely going to be caught near the surface so for that reason drift lines tend to work best. The best baits are those used for any pelagic fish offshore. Sardines, ribbonfish, shad and strips of bonito are among the best baits. During periods of nice conditions in the surf, meaning light winds and seas, beachgoers and surf fishermen will see schools of jacks attack pods of mullet in the surf. If this article stimulates your interest in catching a jack, here are a few tips that will enhance your chances. The jetties, especially out from the rocks rather than in close, are where they are likely to roam. All along the beachfront, from near shore to eight miles or so out, also offers good opportunities. One of my favorite spots to find jacks is near anchored and working shrimp boats within 8 to 10 miles from shore. Once you hook a jack you will not forget it and any angler that has caught a few can tell right away when one is on the line as soon as it strikes. When the strike occurs, the reel starts spinning and newcomers learn quickly not to put their thumb on the spooling line. If big time action is what you are after, go for the jacks. ummer is close to being just a memory. It sure did fly by fast! Now we await the arrival of Fall. September is the month of transition and October is the first month of fall. Lots of folks put the boats and rods up in favor of guns and hunting, but not me. I just get ready for some of the best fishing of the year in Galveston Bay. In September, speckled trout and redfish scatter as they begin their movement to the back reaches of the bay. Black drum, sand trout and croaker start to show up in abundance. These fish can be caught along the deeper reefs, passes and the jetties. Fresh dead shrimp fished on the bottom is the top bait when fishing for these “panfish.” They make for excellent table fare and provide lots of fun for anglers of any age. There is no size or number limit on croakers or sand trout, but the limit on black drum is five fish per day, between 14-30 inches. One fish may be retained that is over 52 inches and it counts toward the daily bag limit. Those anglers in search of specks and reds during this time of year will see a different pattern from summer. In my experience, is it fairly difficult to catch good numbers in any one place during the first few weeks of September. But the fish will settle into a fall pattern by the end of the month. Usually by this time, we should see the arrival of our first cool/cold fronts. Fish will congregate towards the northern ends of our bays where baitfish will depart the marsh. Falling water temperature and tide levels flush bait out of the marsh, where they are intercepted by waiting schools of hungry trout and redfish. We will see our first bird action, where seagulls and terns will pinpoint the schools of fish. Every angler, no matter if they are using live bait or lures, should see plenty of action. Live croaker will take a backseat seat, as live shrimp fished under a popping cork will draw more action for live baiters. Any type of soft plastic will be a top lure for artificial anglers. Weather this time of year is nearly perfect with cool mornings and highs in the mid 80’s. Eagle Point Fishing Camp will stock up on live shrimp this time of year for the angler. Get out on the water and enjoy the fishing and weather. Tight Lines!! Torrey Hawkins, owner of Bayou City Angler, with a nice sunrise red. conditions for fish to feed consistently. September tends to be a month when we see a good bit more Gulf moisture coming onshore. This rain helps a great deal in not only bringing down the salt levels across the bay, but also by cooling the water several degrees during the peak heating hours of the day. for fish, remember that even though you may gain some short term satisfaction, in the long run you are doing more harm than good to both the fish and the habitat. Fish tend to operate mostly on instinct, but they do get conditioned to their environment and repeatedly getting run off of their shallow feeding grounds only moves them to areas that afford greater safety. eel Bounty celebrates their big win with their two blue marlin, weighing in at 547 pounds and 406 pounds. Congratulations! 1st Place Overall went to “Mucho Mas” releasing 1 blue marlin and 5 sailfish giving them a total of 1000 points. “Game Hog” released 1 white marlin and a sailfish for a total of 250 points. They took home 1st Place dolphin and tuna awards. 3rd Place Overall went to “High Noon” releasing 1 blue marlin and 1 white marlin giving them a total of 650 points. nother year of the Texas Billfish Classic is on the books! Tournament Director Jasen Gast came together with all tourney staff, teams and volunteers to put on a hell of an event at Surfside Marina in Freeport. Good conditions offshore allowed great fish to hit the scales, including a 118.9-pound tuna from $ea Dollar$ and a 410-pound blue marlin brought in from Over-Ride. Congratulations to overall tournament champion Over-Ride, owned by Marty Griffith and captained by Ryan Doxey. Colie Blumenshine and Capt. Bob â&#x20AC;&#x153;Mangusâ&#x20AC;? Drisgill with a solid Galveston Bay trout. Fishing everyday is a hard job, but somebody has to do it. Mustard mouth mugshot. Photo by Kelly Groce. Kelly Groce with a 5.9 lb. East Bay trout. Photo by Colie Blumenshine. Team Gulf Coast Mariner with the 1st Place Heaviest Stringer. aero and hydro-dynamics with help from a panel of research experts as well as renowned naval architects from firms like Farr, Judel/Vrojlik, Ker Design, Carkeek Partners, and more. All the principles, formulations, rules and policies of ORC are published at www.orc.org, making this system unique in being completely open and transparent: there are no secrets to how measurements are done nor how ratings are devised, and all certificates issued are available online. These features - open architecture, science-based objective ratings, diversity in scoring options – have all contributed to a recent strong interest in use of ORC as a replacement for existing systems that lack these attributes. Numerous local and regional fleets and clubs in the US have started to adopt use of ORC – these include the Storm Trysail Club at Quantum Key West Race Week, the Biscayne Bay Yacht Racing Association, the Chesapeake Racer Cruiser Association, New York Yacht Club, and more. “We are very interested in using ORC because it fills an important niche for us,” said Ken Humphries of the Galveston Bay PHRF Committee. “We have a very wide range of boat types locally – old boats, new boats, racers and cruisers – and relying on declared dimensions in PHRF certificates is just not accurate. Within the same boat type, it turns out that there can be huge differences in weight, so we want to use a measurement-based system to get the most accurate and most fair ratings possible.” Accordingly, ORC and US Sailing are helping PHRF-GB conduct the first measurement session for Galveston Bay boats to be held over Sept. 24-25 in preparation for certificates to be issued for use in the Harvest Moon Regatta… but also beyond. Anyone with an ORC certificate can use it in any other race or regatta within the US where ORC is offered, such as in Key West or other races and regattas in the upcoming winter season. “We’re excited to lead this initiative on the Gulf Coast,” said Humphries. “We think this will be a tremendous improvement and value to make more fair racing not only in the Harvest Moon, but in other races as well.” For more information, visit www.orc.org or check out the ORC Guidebook at www.orc. org/guidebook. Interview by Charles Milby What factors influenced your decision to purchase a Sabre Yacht? When researching boats prior to our purchase, I had several criteria that would ultimately put the Sabre 38 Centerboard Sloop at the top of the list. Primarily, I felt that a boat in the 38-foot range would give me and my wife Kris a comfortable, affordable, solid platform for mid to long distance cruising. As boats get longer, they get exponentially more expensive to maintain, not to mention more cumbersome and physically demanding for a husband and wife to handle together. One of our other considerations, was the ability to go shallow, since many parts of Florida, the Keys, the Bahamas and the Caribbean have skinny water. And, we wanted a solidly built boat, one that could handle a bluewater passage without reservations with regard to safety, seaworthiness and robust components. The Sabre 38 centerboarder met all of those criteria. Sabre Yachts is still in business in Casco, Maine and that also heavily influenced our decision. They have our boat, hull #99 in their database and have stepped up numerous times to assist in the refit, with vendor phone numbers, design details not found in the Owner’s Manual and fixes for recurring problems. “She’s very stable, not tender, points well and is easy to balance on nearly every point of sail.” Once you made the purchase, what were your expectations regarding time and money needed to refit the boat? Orion is a 1987 build, and was a lovingly maintained one owner boat prior to our purchase. But, the reality is she was 25 years old, which is relatively ancient for a plastic boat. The electronics were all outdated, the standing rigging was original, the running rigging and sails were serviceable, but in need of replacing, there were the usual bits of other hardware that had seen better days, as well as numerous water entry points that needed to be addressed. David Popken was born in Grants Pass, OR in 1948. After high school and the US Army, where he served in the Vietnam War, he graduated from Washington State University and pursued a short career in cinematography and film. Changing careers, he moved to Houston in 1980 to work in real estate. He started his own residential building/remodeling company in 1983 and is still in business, but is planning to retire soon to go out and experience the cruising lifestyle. David and his wife Kris bought their first sailboat, a 1978 Hunter 30 in 2002. They have been avid sailors ever since, daysailing, racing and cruising whenever possible. David has recently turned his attention towards writing about sailing and sailboat maintenance. His stories have been published in Sail Magazine, Telltales and GCM. and when something happens, we answer to a much higher power, the United States Government and the State of Texas. We as pilots have upper level Marine Licenses that takes years to obtain, after which we sail on the licenses for many years before being chosen as a pilot. The testing and the apprentice takes over three years before you are considered a pilot. No one does more for the Houston economy that the Houston Pilots and we do it all year long. turnout of J/ Boats, including the J22, J24, J70, J80, J105, J/ PHRF classes. Cranes and storage for out of town boats are available, and there are numerous hotels located near Lakewood Yacht Club. Those who want to watch the action can sign up to enjoy the on-the-water action from the deck of the Liberty Bell, a 60-foot motor yacht. J/Fest Southwest 2016 will feature the well-known LC Roots Band for Saturday night entertainment and dancing as well as the traditional “Frogmore Stew” ( shrimp boil) dinner. Visit the new J/ Fest Southwest website (www. jfestsouthwest.com), which is regularly updated with new information, including a list of hotels for out of town skippers and their crews. Seabrook is located half-way between Houston and Galveston, and there are numerous opportunities for family fun in the area, so come on down! n her orangegloved hands Coastal Fisheries Technician Claire Iseton holds three empty oyster shells. The few oysters that do come up in the basket are black and lifeless. Coming up empty within site of Kemah’s famous seafood boardwalk where oysters are on the menu from November through April 30 is not a good sign, but it’s a trend that’s been deepening since 2000, when oysters large enough for the market suddenly plummeted and have been on a steady decline since. What it takes There’s no telling the age of the live and dead oysters dredged up this morning, but what the team does know is that it takes about two years for a spat to become a mature oyster. And, the bay’s once prolific oysters reefs just haven’t had enough time to recover before they are dealt another blow. Cattle-crossing prolific Over 50 years ago, oyster reefs in Galveston and surrounding bays were so common that the coastal roads were paved with oyster shells. Over a century ago, before roads and railroads, a natural oyster reef linked both sides of Galveston Bay. So prominent was this reef that, given a stiff north wind and a low tide, cattle crossed the bay on this ridge. TPWD Coastal Fisheries Field Technician Claire Iseton holds three empty oyster shells during a morning dredge sampling. New court date set to save the bay waters from S.T.O.R.M. Claire Iseton inspects an oyster sampling on TPWD’s vessel, the Trinity Bay, at a reef within sight of the Kemah Boardwalk. Pressures all around Add to these natural pressures, there’s the human pressure: more people live in Texas than 50 years ago, and there’s more demand to enjoy oysters at the table. Fishermen are pressured to harvest the very material that might provide the future harvest. And, they can get a good price for it. In 2014, a sack of oysters commanded $35, up $20 from 1993. Given current low harvest counts, this year’s price may well be that, or higher. Recovery, Restoration, Intervention It’s unknown just how much of Galveston and the surrounding bays are covered with oyster reefs. The last complete mapping survey was done 21 years ago by Eric N. Powell who tapped the bottom of the bay with a pole to pinpoint reefs. His research on the Eastern oyster continues. Sophisticated technology like hydroacoustics and side scan imagery has been useful for mapping specific losses, like in the aftermath of Ike, but the application for the whole bay is considered time consuming. In the meantime, man’s efforts to recover the losses seem like a drop in the bucket. Since 2009, reef restoration efforts have only restored about 1/10 of what’s been lost, 1,300 acres of the bay. And, many of those restoration sites are off limits to fishing until they can flourish. On June 11, Galveston County Judge Mark A. Henry took the first step to help area oyster business owners get financial assistance by declaring a local disaster. In order to get funding, oysters farmers will need a disaster declaration from the State of Texas. The Judge is in the process of submitting a formal request to Governor Abbott for targeted legislation to address the issue. STORM has so far failed to take the property rights of Oyster Fisherman as their own property and limit access to the Gulf waters of private citizens. This is a critical matter for the entire seafood industry, recreational fishermen, and private land owners. Help is on the way to stop this illegal takeover and save access to the Gulf waters in the form of a hearing which has been set to void the STORM lease in the 56th District Court of Judge Lonnie Cox on September 26, 2016 at 11 a.m., in Galveston County, Texas. The Galveston Bay oystermen and fishermen need your support and ask the public to join them in court, in body if possible, or if not, in thought and prayer for a verdict to end STORM’s unprecedented and unlawful attempt to take over Galveston Bay. s fall fish move about to their new homes, species such as drum, flounder and snapper are readily available for catch or purchase. And with the onset of cooler temps, our appetites are ready for heartier fare. Think soups, stews, and chowders. It is also convenient to have an easy make ahead main dish ingredient for a simple but filling meal preparation. Pulled pork is a flavorful food that can be served over rice, on baked potatoes or in tortillas. Just add avocado. Grease slow cooker container with oil or spray. Cut pork into several large pieces and pat with salt and pepper and place in slow cooker. Pour salsa over pork. Sprinkle with dried spices. Add optional green peppers. Add water if necessary to cover pork. Turn on high and cook for about 8 hours, or until pork is falling apart. To serve, use two forks to pull meat apart, while in cooker. Serve over rice, baked potatoes, or wrapped in tortillas. Garnish all with shredded cheese and avocado. Fry bacon in pan until crispy, remove from pan for crumbling, and keep grease. Sear fish chunks in hot bacon grease for several minutes, then remove from pan and sprinkle with salt and pepper; set aside. Par boil the chopped potatoes for ten minutes, drain and place in large stew pot, adding the diced carrots. Crumble the cooked bacon on top, Sear the onions, mushrooms and any added veggies in bacon grease for several minutes with a dash of Old Bay, then pour the whole mixture into the stew pot. Sprinkle with more salt and pepper and 1-3 Tablespoon Old Bay. Add half and half (and water if needed) to just cover the mixture, and simmer for 20 minutes on medium heat. You may thicken with flour if you prefer a thicker broth. Add cooked, seared drum for last five minutes of cooking. Serve with warm crusty bread.